Upper Deck has always been a proud supporter of the United States Military. 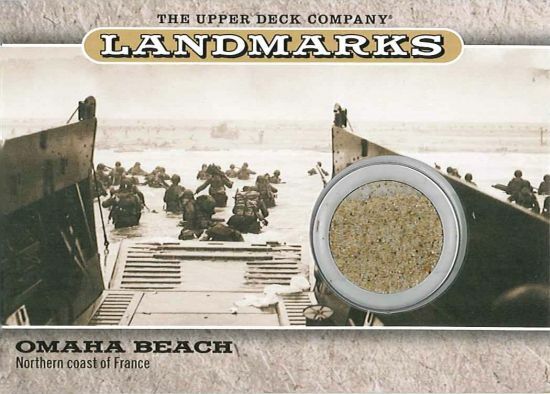 Upper Deck works hard to show our appreciation of the military through philanthropic efforts and by including veterans into new trading card sets. We have even incorporated military moments on trading cards in sets like Goodwin Champions. 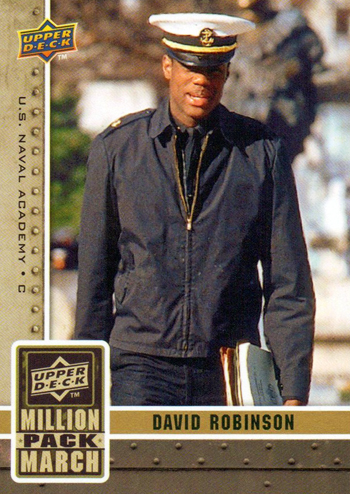 Robinson won the Naismith and Wooden award during his senior year at the United States Naval Academy. After graduating from one of the nation’s top military schools, David served for two years in the Navy. After serving his country, David dominated the NBA and the Olympics. Wooden is a three time All-American and helped Purdue win the 1932 National Championship. After a successful academic and athletic career at Purdue, Wooden enlisted in the Navy after the attack on Pearl Harbor. Wooden was a lieutenant when he left the Navy and went on to become one of the greatest coaches in college history with UCLA. 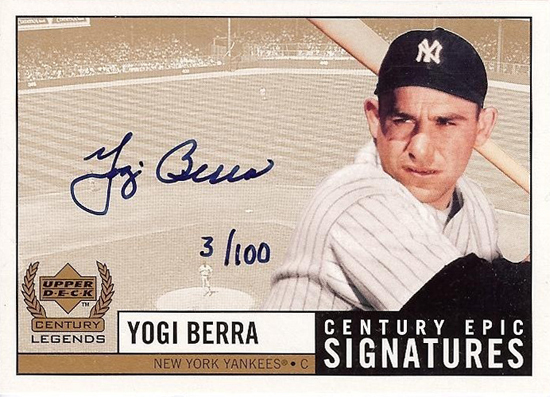 Yogi served in the United States Navy during World War II. Berra was a gunner’s mate on a ship off the coast of Normandy during the D-Day invasion. 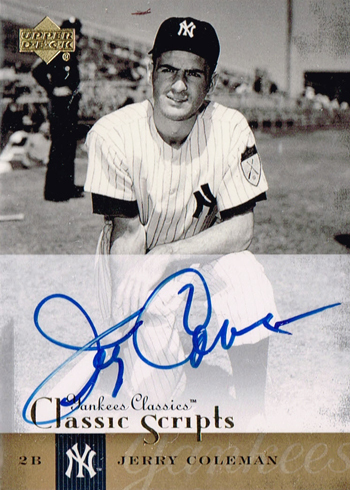 Berra went on to be one of the greatest players in New York Yankee history. 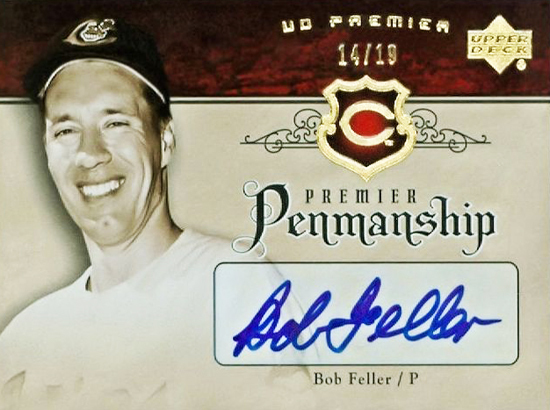 Bob Feller was the first MLB player to volunteer for active duty after the Pearl Harbor attack. Feller returned to the MLB after serving for four years on the USS Alabama as an anti-aircraft gun captain. When he retired in 1956 after an 18-year professional career, Feller was a World Series champion and eight-time All-Star and pitched three no-hitters. Though he only played as an amateur, Bobby Jones is considered to be one of the greatest golfers ever. 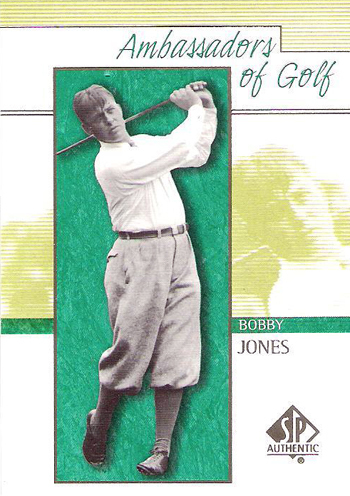 Jones won all four of the major golf tournaments in 1930. Jones served as an officer in the United States Army Air Force during World War II. He bought and developed Augusta National in Georgia and raised cattle on the land in order to help with the war efforts. 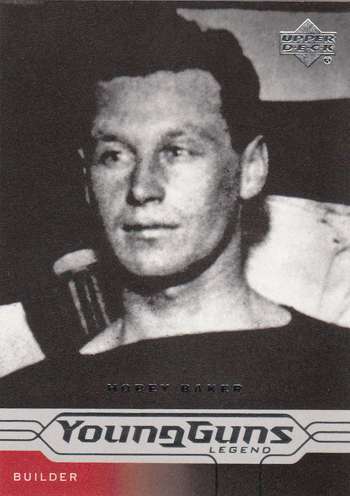 Hobey is considered to be the United State’s first superstar hockey player. After dominating at Princeton University, Baker enlisted in the United States Army Air Force during the World War I. After surviving the war and receiving numerous military awards, Hobey died in post-war plane accident. The Hobey Baker Memorial Award is given to the top NCAA athlete each year. Jerry Coleman is the only Major League Baseball player to have seen combat in two wars. Coleman flew in 120 combat missions during World War II and the Korean War. Coleman went on to win four World Series championships with the New York Yankees. After his professional career, Coleman excelled in sports broadcasting. After his first Triple Crown season, Ted Williams served as a flight instructor during World War II. Williams was recalled back to duty in the beginning of the Korean War. He flew in 39 combat missions before being forced to stop flying due to an inner ear infection. 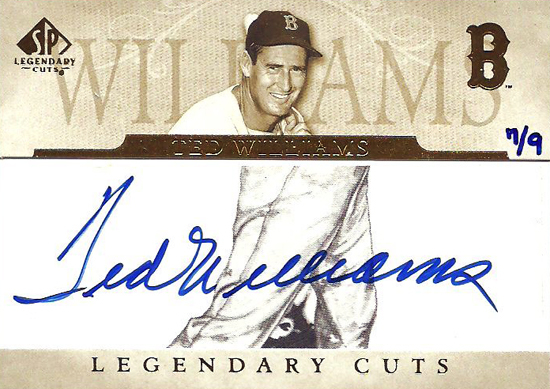 In his 21 year career with the Boston Red Sox, Williams won the Triple Crown twice, was an All-Star 17 times, was the last player to bat over .400 in a single season and twice was the American League MVP. After playing for one year in the National Football League, Rocky was drafted into the Army and was shipped over to Vietnam. While on patrol, Rocky’s platoon was ambushed and he suffered a severe leg injury from grenade shrapnel. After being told that he would never play professional football again, Rocky attended the Steelers training camp one year after the ambush. 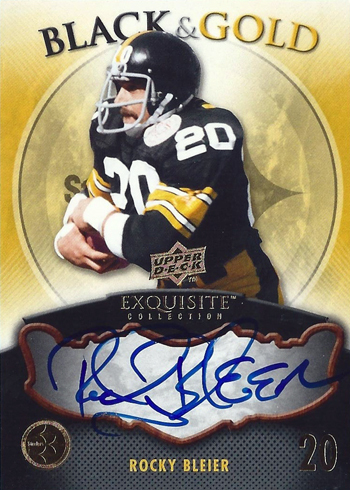 When he retired in 1980, Bleier had 3,865 rushing yards, 1,294 receiving yards, 25 touchdowns and four Super Bowl Championships to his credit. Pat Tillman is an American hero, pure and simple. 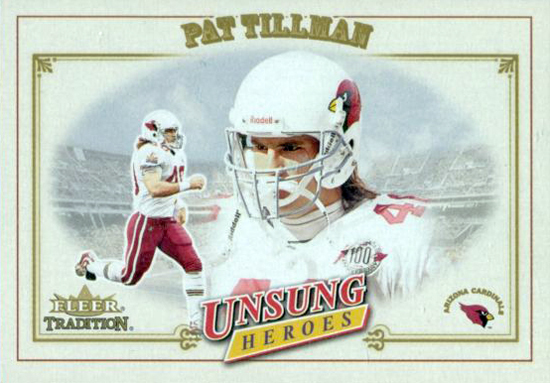 Eight months after the attacks on Sept. 11, 2001, Pat Tillman chose to leave his professional football career with the Arizona Cardinals ($3.6 million contract) and join the U.S. Army. He served a tour in Iraq before being redeployed to Afghanistan. He was killed in a friendly fire incident. He was awarded a Silver Star, Purple Heart and a posthumous promotion. Heroes like Feller who left hall of fame careers to serve our country in the greatest cause the world has ever seen is nothing short of amazing. Even those like DiMaggio, who would never get close to the front lines, sacrificed fame and money to serve in any way. We are a better world because of them! i played basketball in the army myself and salute all that combine sports and military.it makes their efforts in sports even more remarkable,since members of the mentioned list spent time in war zones during their prime as athletes. I just wanted to say thank you to all the men and women serving and those that have proudly served. You don’t see players leaving their sport to go fight anymore like Ted Williams, Bob Feller and the late great Pat Tillman, there are many more that also served. It says a lot about their character. It wasn’t about era, home runs or a World Series but about protecting this great nation of ours! Lets all remember Memorial Day isn’t about bar b question and swimming but honoring an remembering those brave souls that fought an are fighting for us. In another year with the US entangled in a global war against an enemy on foreign soil and homeland Main Street (ex. Boston Marathon bombing,) the importance of serving one’s country has never been more essential to the preservation of our freedom. Professional sports exist as a great distraction from the troubles of the times, but athletes who forgo the glory of the arena for the selfless glory of protecting their fellow countrymen deserve as much recognition as possible. It’s honorable for Upper Deck to pay homage to Doc Jacobs and all the athletes who have made this sacrifice to keep this country free. Every service man and woman deserves their own honor card and it’s unfortunate that only athletes get this honor. The sacrifices that any soldier makes in the name of freedom are difficult to put into words. Whether it is saying goodbye to a spouse, child, sibling, parent, or friend, to venture into the unknown for the sole cause of protecting the freedom of people that they don’t even know is as noble of a cause as there is. These are the heroes that we should be collecting. These are the trading cards that I want. Veterans are not only model citizens, but they also embody the ideal athlete. Veterans are humble, selfless, and loyal. They deserve their own cards to forever honor their service to their country. Anyone who serves in the Armed Forces and can follow their dreams in any Professional Sport are true hero’s. They can bring so many different skill sets, and know what it means to be a true Teammate!!! Happy Memorial day to our past an present Servicemen and Woman. To be able to say that a person had the opportunity to serve our wonderful country via the armed forces is one helluva an honor and a story, but then throw in the professional sports career as well. That creates a heroic legend and they will never be forgotten! They deserve cards because they have a great career that will bring them more than enough money and some fame, and they give it all up to help their country. They don’t do it for the money, they don’t do it for the fame, they don’t do it because they are required to, they do it because they want to help their country. They realize that at the end of the day, they are just a normal person and are willing to help out even if it means loosing their job or even their life. I believe every person who is brave enough to serve our beautiful country should have their own card. These men not only entertained us on a field,but also in battle for our country.There is greater sacrifice then putting your life on the line.For that we owe them more then we could ever repay,a card would be a great way to show a little appreciation for the sacrifices these men of sport,and battle have made! Love of country came before love of the game! I thank God for men like Tommy Lasorda, Pat Tillman, Joe Louis, Ted Williams & Doc Jacobs! People say where have all the heroes gone? They are protecting us everyday! Athletes and soldiers are both idolized very much, but when you have an athlete turned soldier, then in my eyes that is the true definition of a hero. As much as these professions are idolized in the world, such are upper deck hockey cards in the world of collectors. When people, especially kids, see athletes on the cards they collect, it broadens their minds as well to let them know that being in the army/navy/etc does not mean you cannot follow your dreams to be an athlete. 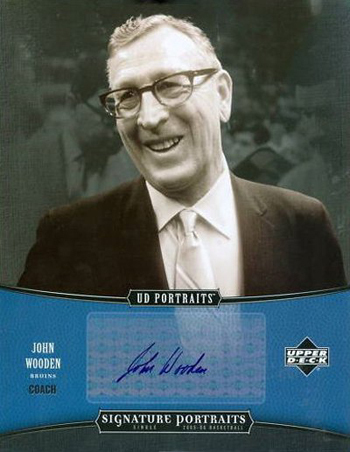 I think people like Tillman and Jacobs on sports cards are a great idea, especially with the excellent job upper deck does in designing these cards, and also with the the descriptions they put on the back of the cards. These legends in athletic achievement live on in or memories,but heroes live in our thoughts and hearts. Service,dedication,team and sacrifice are words we use to describe the content of a hero’s character. Words are not enough though as they stand tall so we can enjoy not only our pastimes,but our way of life. not only in sports,but in life heros such as these need not only the recognition, but a heartfelt thank you from all americans for you are legends and heroes to us all. The easiest thing for anyone to say is “no thanks” and continue on with their life. The fact that they took the road less traveled and put the needs of their country ahead of their own makes them, along with the many other brave men and women, very honorable and heroic. Freedom is not free, and for their unselfish sacrifice we thank them. I think it’s great to honor these folks, because while they entertained us on the field of sports they were also willing to sacrifice their time and risk their lives to support and defend their country. These are men (and women) who understand that life is more than a game, and what you do outside the lines will always be more important than what you can do inside them. It show’s that Veterans are real people to. Being a veteran we serve our Country Faithfully and Happily.It’s great to see Doc and others FOREVER REMEMBERED on Upper Deck Cards, WE WILL NEVER FORGET. A lot of children grow up with there favorite sports players as there greatest heroes and it is not until later in life that they understand that many men and women have sacrificed so much for this great country of ours. By Upper Deck including all of the athletes who have served this country so proudly and putting the chance to play professionally at the sport of there dreams or walking away from the game in there prime will help to show the younger children who collect card who the true heroes are in this Great Country of ours. There are also many Great fallen heroes out there who are worthy of mention who never made it onto a professional sports field that should have cards randomly inserted in all card products. I am a disabled vet. I was injured in Iraq in 2004. When I got hurt, I suffered from memory loss from a severe head concussion. Before my injury in 2004, I almost completely forgot about collecting sports cards. There was one thing I remembered though, collecting baseball cards my grandpa bought for me when I was a kid. It brought back the feeling of excitement and the surprise feeling I got when opening packs. Both of my grandfathers and my father served in the military with my dad retiring after nearly 30 years in the Air Force. During which time he served remote tours to Korea and as a commander in the Kosovo War. Some of these athletes had a choice to serve and some were drafted. But they, like my father and grandfathers, sacrificed their lives so that my 9 year old son and I could have the freedom to enjoy an American pastime, like card collecting. It would be great to have a set of cards dedicated to servicemen and women who lost their lives protecting our freedom. These men and women, truly understand the word sacrifice. Sacrifice is so seldom seen in today’s athleletes, to be replaced by selfishness. These athletes are true role models and heroes, who represent the best in sport. and we embrace the heroes that sport creates. More than fanfare, more than fame. So the world can unite and stand tall. of being true heroes for humanity. There are no words I can use to express the feeling. Brave men stood up for us and to many lost there life so I can collect cards I love. Thanks never forget.